Sawtelle thanks Hammond for sending Brace Up Thoughts. 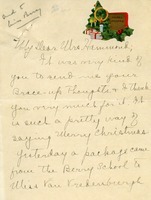 A package of Christmas cotton came recently for Miss Van Vredenburgh, who died in 1926. It must have been an oversight, but it quite upset Sawtelle and Mrs. Wedderman.